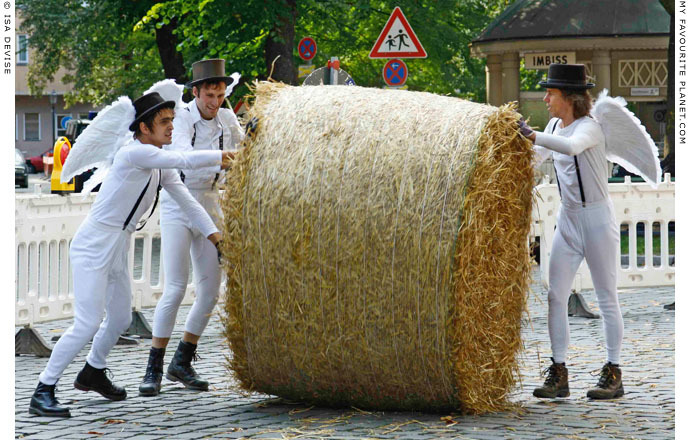 The first "Popráci" straw bale rolling competition took place in September 1737 between German Rixdorfers and Protestant refugees from Bohemia who had settled here. 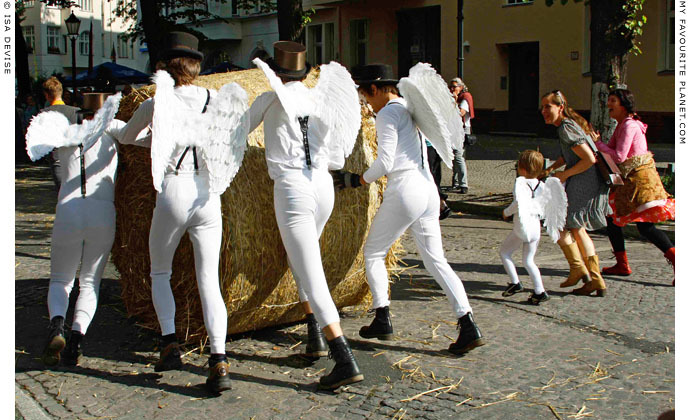 Banned in 1912 by Kaiser Wilhelm II, the tradition was revived in 2008 by the local artists' group Künstlerkolonie Rixdorf. See history below. The annual contest takes place around the blacksmith's, Rixdorfer Schmiede, on Richardplatz, the historic heart of the former village of Rixdorf, which is now part of the Neukölln district, just south of Berlin's city centre. As you would expect from such a German-Czech event, the atmosphere is that of a street festival with music, dancing and plenty of eating, drinking and merry-making. There are even theatre performances, a rap contest and games for kids. The Rue Bunte "Barta" team stretch their wings pre-race. 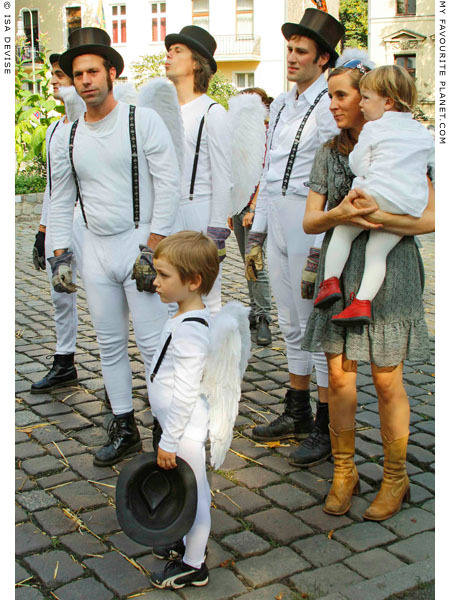 Not only did the lads from the Rue Bunte win the competition, but their costumes also won them a special prize for originality. 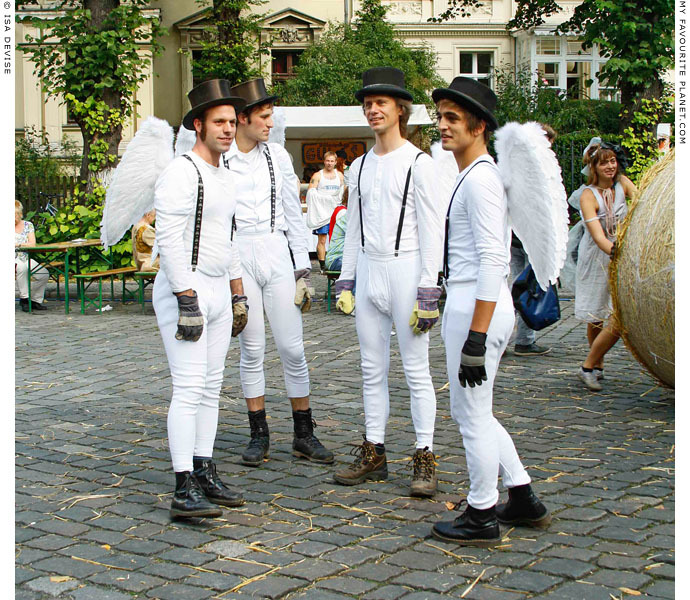 A strange mix of angelic wings, and the white uniforms, braces and "bovver boots" of Alex and his Droogs, the gang in Stanley Kubrick's movie A Clockwork Orange (the film's costumes were designed by Milena Canonero). Coincidentally, there were four of them too. Their top hats lend them a touch of chimney sweep - a bit of "Chim chiminey, Chim chiminey, Chim chim cher-ee...". The Rue Bunte "Barta" team observe the opening of the competition. Consider yourself lucky that it's not Fidel Castro making the opening speech. 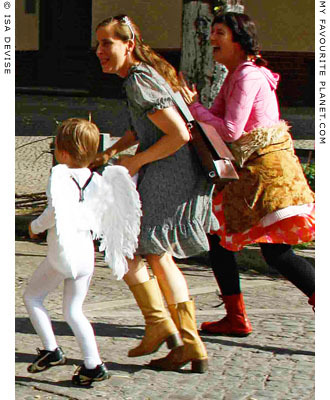 On the right of the photo is Bärbel Höhmann, actress, Montessori teacher, mother (of Angel Paul, left) and one of the founders of the local arts venue Rue Bunte. Bärbel led the cheering and morale support for the team, and we suspect she was also responsible for the costume design. The Rue Bunte "Barta" team enter the fray. The Rue Bunte team are about to face the moment of truth. Will their months of arduous training and meticulous planning pay off? Will they be able to match the strength, stamina, speed and cunning of the oppostion? In 2009 they managed 3rd place in a tough field, including a world record-breaking effort (a jaw-dropping 1 minute, 24 seconds!) by the winning "Wanzlik" team from Usti nad Orlici in the Czech Republic. If you imagine it's easy to push a straw bale "as high as a man and a hundredweight heavy" (around 100 kg) - which steers like a cow - along a cobblestone street, think again. Ever tried cycling on cobblestones? Brings tears to the eyes and loosens the brain and bowels. It takes three strong, athletic team members to heave the monster bale upto speed while the fourth (a bit like the coxswain in a rowing team) directs and remains ready to give it a course-correctional slam when needed. One and a half minutes are a long time in straw bale rolling, and every second counts. Bärbel and Paul lead the supporters in cheering the sportsmen on to victory. Winning this competition, which takes place over three knock-out rounds, is not just a matter speed: points are also awarded for originality, team spirit, fairness and congeniality. After the straw bale rolling there is also a quiz to test the teams' local knowledge. Points are deducted for infringements such as hitting the kerb. So, steady as you go, and a bit of the left hand down a bit. After all the huffing and puffing, there's nothing like getting up on the stage, holding the glittering prize aloft, enjoying the accolade and the savouring the prospect of a cold beer. A bitter disappointment for the losing teams, but there's always next year, guys. The winning team get to keep the trophy, which was donated by the Czech Embassy, for a year before defending their hard-won title in 2011. 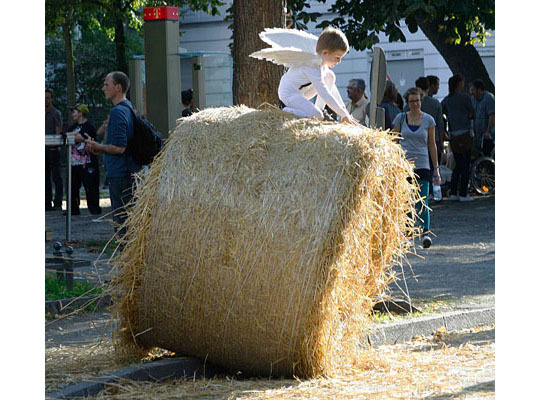 The first Popráci straw bale race in September 1737 was a contest between German Rixdorfers and Protestant refugees from Bohemia (today part of the Czech Republic) who had been invited by the Prussian king Friedrich Wilhelm I to settle there. At the time Rixdorf, founded as Richardsdorp in 1360, was a small farming community outside Berlin. The competition was dreamed up by the German village mayor Friedrich Fetzke und the Bohemian community leader Bohumil Pachl in an attempt to get the two communities together and defuse inter-cultural tensions, especially between the young men, which often led to violence. Apart from the obvious clash of cultures, customs and languages, the local Germans understandably begrudged the fact that the Czech newcomers were given exemption from taxation and military service. This was part of Friedrich Wilhelm's incentive policy to draw workers and skilled craftspersons to Berlin and encourage economic growth. Such incentives, which included a promise of religious freedom, drew oppressed minorities such as Moravians and Huguenots from all over Europe, particularly France and the Netherlands. 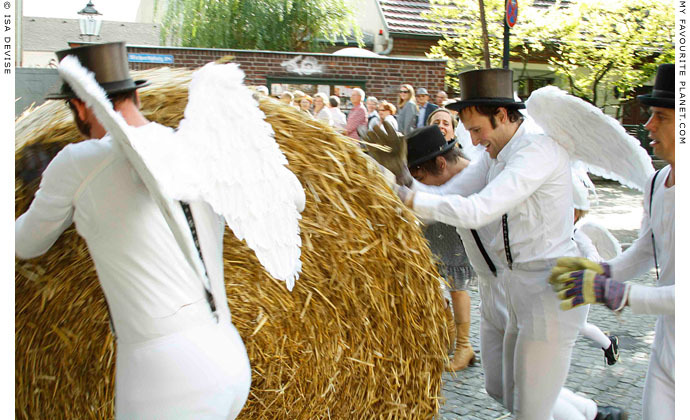 The Strohballenrollen, which took place on the second September weekend, just after the harvest, was an ideal way of letting young men show off their strength and let off steam, as well as an opportunity for people to get to know each other. The prize for the winning team was 2 gold ducats, which would buy quite a few beers back then. The prize money was hidden in one of the straw bales, so presumably there would have been an entertaining bale-demolishing frenzy at the end of the race. 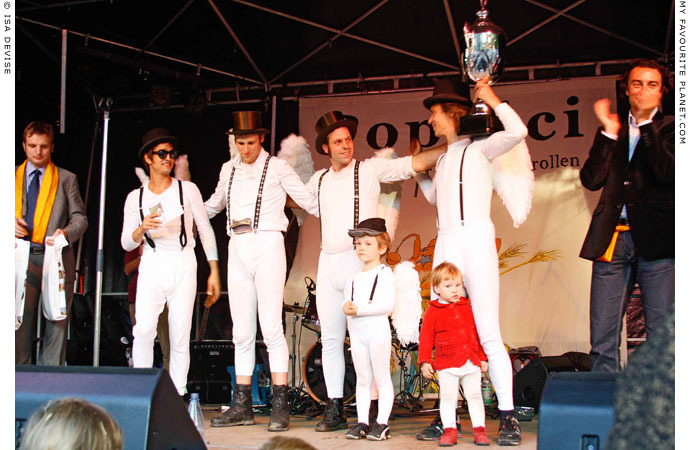 Over the years the village sports event drew in participants and spectators from all over the Berlin area and grew into a large popular festival. 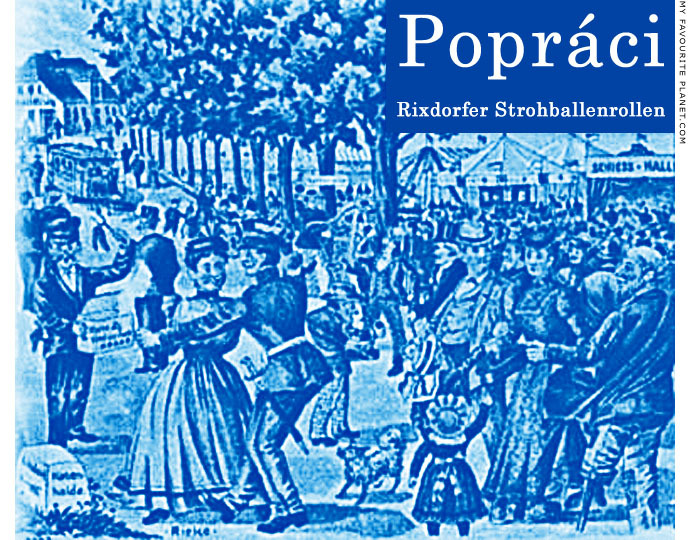 Legend has it that the name Popráci originated from the fact that when Germans would invite their Bohemian neighbours to get together, the industrious Bohemians would answer "po práci", which means "after work" or "after the work is finished". Does this make the Popráci the original after-work party? By 1911 the compettion had taken place 174 times. However, in 1912, during the reign of Kaiser Wilhelm II, Rixdorf and other settlements were almagamated into the new district of Neukölln. At the same time the Popráci was forbidden. 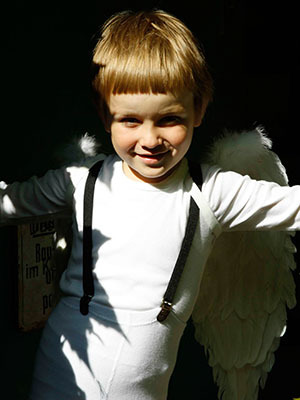 The tradition was revived in 2008 by the local artists' group Künstlerkolonie Rixdorf, and has once again become a lively, popular event. Typisch Berlin. The straw jamboree has also provided a modern revival of the local intercultural links between Germany and the Czech Republic, with the support and cooperation of Neukölln's Czech twin town Usti nad Orlici and the Czech Embassy in Berlin which donated the winners's cup. Who says multiculturalism doesn't work? Rixdorfer Strohballenrollen is organized by Kulturgut Kiez e.V. Founded in 2005 by a group of artists, actors and musicians, the Rue Bunte has established itself as one of Berlin's most relaxed and friendly arts venues. The atmosphere is always superb and the events well-worth experiencing. A great insider tip if you are visiting Berlin. Rue Bunte describes itself as "the green oasis in the city". Behind a 19th century apartment house in Berlin's Neukölln district, the hinterhof (back yard) has been transformed into a large rambling garden which is used for concerts, theatre performances and parties. There is also a long single-storey building, a former car repair workshop, now a rehearsal studio, performance venue (when it's too cold or wet to play outside) and exhibition space. 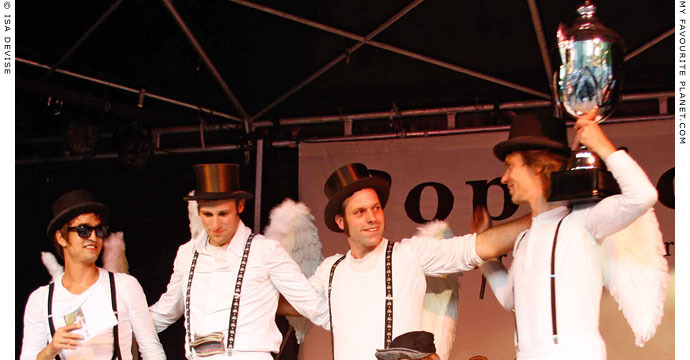 Several times a year the Buntées host their open stage show "Krumme Lampe" (Crooked Lamp, a wordplay on the Berlin suburb of Krumme Lanke and Lampenfieber, stage fright). Since 2005 all kinds of weird and wonderful acts have appeared and helped make these evenings local legend. The acoustic pop music trio Zukunft und die Lichter (Future and the Lights) also have their base here and use the studio for rehearsals, recording and occasional gigs. Songwriter Sebastian Zukunft (his real name) is one of Rue Bunte's founders, and he and drummer Martin Wahl are also members of the Strohballenrollen team. 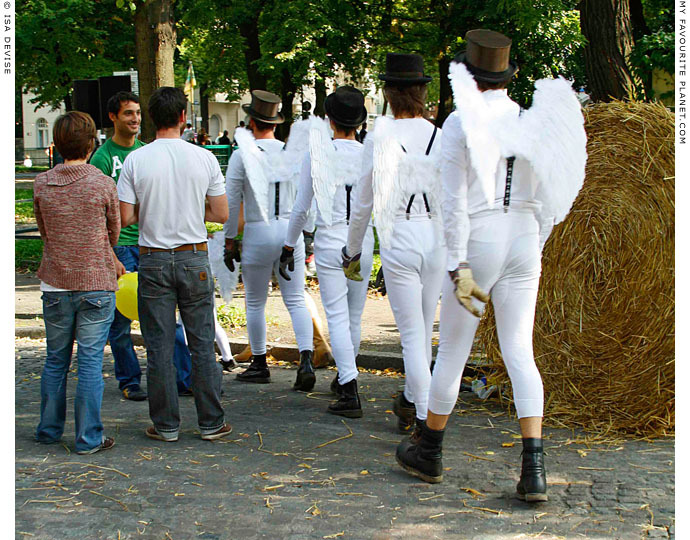 Each summer the Rue Bunte takes part in the annual weekend arts festival 48 Stunden Neukölln (48 Hours Neukoelln) which has become an enormous event (or series of events) in numerous venues across the borough. An old working class district of West Berlin, Neukoelln was once a poor and decidedly unfashionable district. Over the last decade it has become home to young and creative people from all over the world (driven out of other arty areas of Berlin such as Prenzlauer Berg by rising property prices and yuppification). Consequently the place has livened up considerably and offers a wide variety of arts and entertainment.